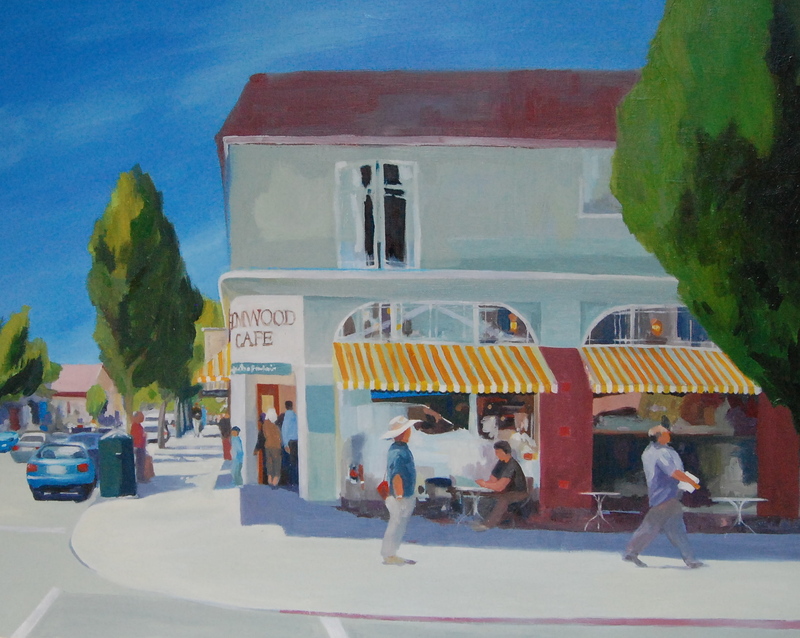 Just finished wrestling with a painting commission for a wonderful family who lived locally for two years and wanted to remember the intense blue skies of California and the local flavor of Elmwood, when back in Europe. 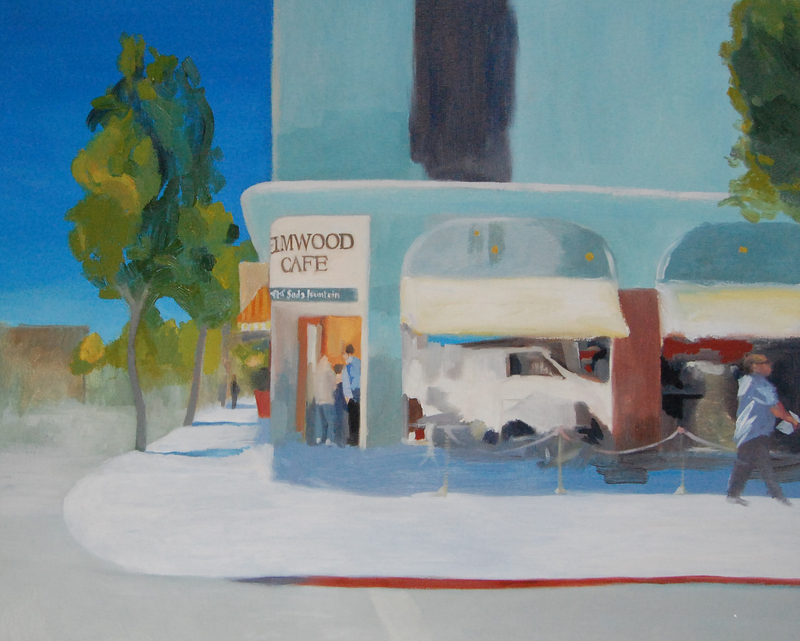 The Elmwood Café, which anchors a busy corner of College Avenue, was chosen as the perfect subject for their painting. The café was renovated recently, and has quickly become a wonderful gathering place, with great coffee and fantastic pastries. Originally Ozzie’s Soda Fountain, the premises have always been a notable Berkeley hangout, where the proprietor ‘Ozzie’ Osborne cultivated a sense of community and belonging. The current establishment follows an unusual business model, by investing 50% of its profits into charitable projects, and customers can become more involved by voting for their favorites. The watercolor sketch was fun to do because the café is so busy and lively but I had to work on two separate versions of the final oil painting before we were all happy with the results. At only 6 x 12 inches, the watercolor is still sitting in my sketchbook, and is much smaller than the two full size oil paintings (both 24 x 30 inches). The family chose version I because it has more detail and will help them remember and share their experiences with friends more easily. I prefer version II because it is more vague and sketchy but then, I am still living here. What an interesting project! This entry was posted in Art Journal and tagged Berkeley, Fran Osborne, oil landscape, ozzie osborne, soda fountain, watercolor. Bookmark the permalink. Wonderful subject. 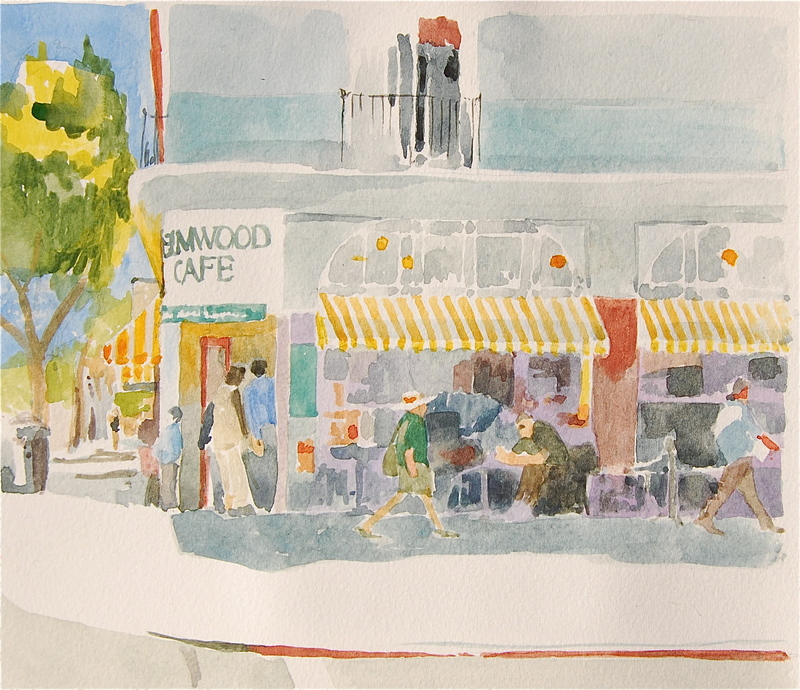 I lived in the Elmwood for twelve years and had quite a fondness for the Elmwood Pharmacy/Ozzie’s Soda Fountain. I remember in the 70s on the Russell side window they had a large collection of bizarrely dressed Barbie’s–“Biker Barbie,” “Protestor Barbie,” etc. I’m sure your patron was delighted with the end result and having a piece of California to take back to Europe. Thanks so much Jane. I love the idea of those Barbie dolls in the window. I’ve seen something similar as part of the counter of the Lane-splitter Pizza on Telegraph in Temescal. Great to see you the other day.